Bucco macrorhynchos J. F. Gmelin, 1788, Cayenne. Forms a su-perspecies with N. swainsoni of the Brazilian Atlantic forest. Two subspecies. French: Tamatia a gros bec; German: Weifihals-faulvogel; Spanish: Buco Picogordo. 11 in (25 cm); 2.9-3.7 oz (81-106 g). Black upperparts and broad chest band, white forehead, collar, throat and belly. Variable dark barring on flanks. Bill and feet black. 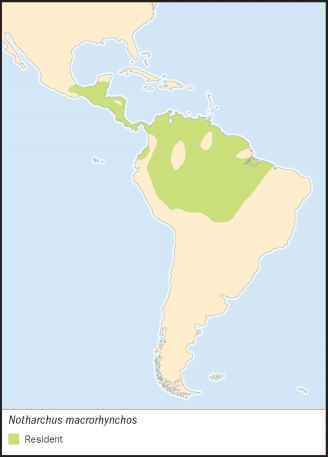 N. m. hyperrhynchus: Mexico south to Venezuela, Colombia, Ecuador, eastern Peru, northern Bolivia, and western Brazil; N. m. macrorhynchos: eastern Venezuela, the Guianas, and northern Brazil south to the Amazon. Humid to semiarid forest, open woodland, clearings, and plantations (0-3,940 ft [0-1,200 m]). Pair territorial and sedentary; generally found perching stolidly on high open branches, but otherwise inconspicuous. Hunts at all levels, from ant swarms to upper canopy, preying on large insects and small vertebrates; some vegetable matter. Nests excavated by both pair members in arboreal termitaries, usually 40-50 ft (12-15 m) up (occasionally 10-60 ft [3-18 m]). Holes in the ground or in trees are also reported. 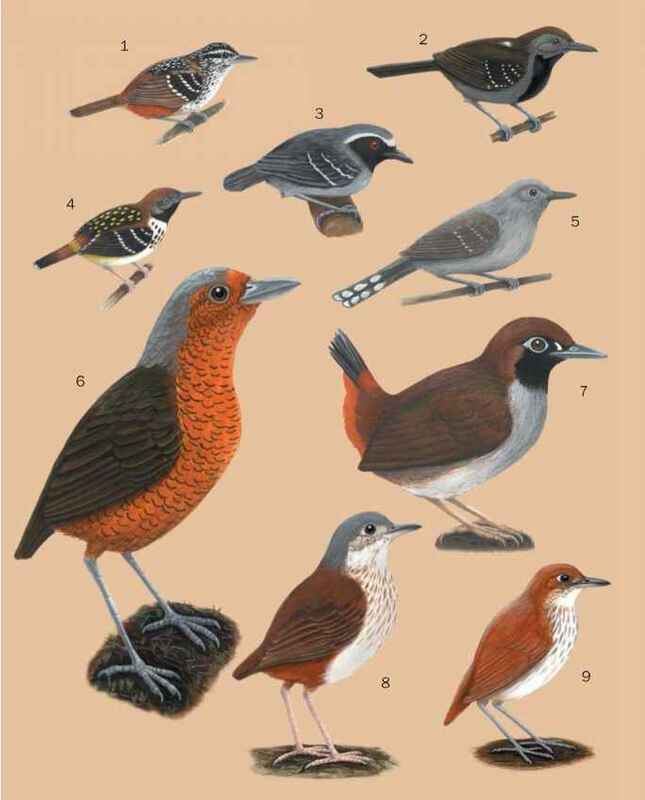 Not threatened: scarce in Central America, widespread and often fairly numerous in South America.